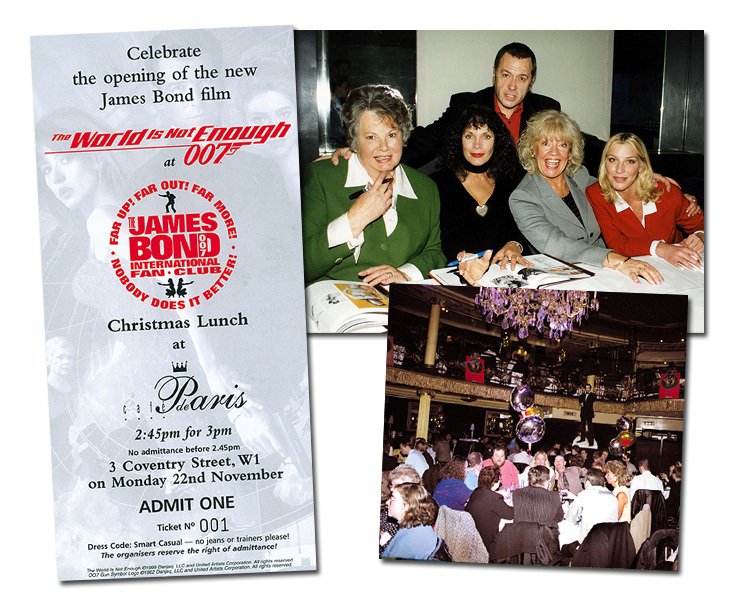 The James Bond 007 International Fan Club 7th Christmas Lunch was held on November 22nd 1999 at Café de Paris, London. 200 Club members celebrate the opening of the new James Bond film The World Is Not Enough at a morning preview, and the re-publication of Graham Rye’s all-new pictorial edition of his book The James Bond Girls. The event is attended by special 'Bond Girl' guests Martine Beswicke (From Russia With Love & Thunderball), Molly Peters (Thunderball), Jan Williams (From Russia With Love) and powerboat champion Sarah Donohue who doubled Maria Grazia Cucinotta in The World Is Not Enough.